If you're just starting out as a soccer coach, say your son or daughter are beginning to kick the ball around the house, and they now want to join a youth soccer team, then it's not a bad idea to seek out a soccer drills or soccer coaching DVD. Where do you start though? 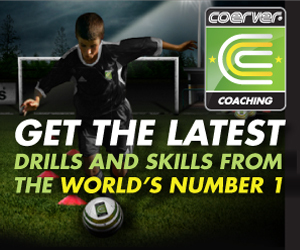 Well, you can't go wrong with a Coerver Coaching DVD, since their entire system and coaching method is based around improving your skills on the ball. And that's the key to the game of soccer. If you don't have touch and control then you can pass, shoot or cross. It's all about technical ball skills. But here are a few other options for excellent soccer coaching DVDs to choose from, along with the top Coerver DVD. Learn the skills and gain the confidence to succeed in the game with Coerver Coaching’s Make Your Move DVD series! Built around our unique and highly effective Pyramid of Player Development, the exercises on these discs build an all-around soccer competitor with advanced skills for handling the ball alone and against the competition during attack and defense. Take your game to the next level and learn to play like a champion with Sir Alex Ferguson and the first team players of Manchester United! Along with the club's Academy soccer players, you can learn soccer skills like the Flick Behind, the Step Over and the Roller Coaster. Along with the fundamentals of the game, like shielding the ball. A 6 disk series (including Blast The Ball) is over 11 hours of raw one on one soccer technical skills for all levels of soccer players, soccer parents, and soccer coaches. NEVER before has a such an extensive series ever been released that focuses directly on learning and teaching raw technical skills. The series is over 65 chapters long and covers every level from beginner to very advanced technical training. Practice your soccer skills and polish your game all year long with Coerver Coaching’s Improve Your Game DVD training set! 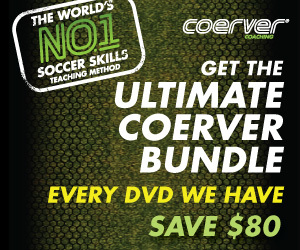 Designed to complement Coerver's soccer camps, these DVDs can be used by players at home, both alone and with the help of parents, friends, coaches or teammates. Improve Your Game focuses on three levels of self-improvement (Skill, Strength & Stamina).